Provost, Chairman, Ladies and gentlemen, I am very conscious of the honour and privilege of being invited to give this lecture tonight, especially since I follow a line of very much more distinguished people who have given this lecture since it was inaugurated in 1991. But I am also very grateful that you have given me the opportunity to try to say something which I believe to be crucially important to the future of general practice, and even to future of the modern world. And as I learn more about Tom Stewart, for example from my brother Andrew, who knew him, I realise the extraordinary extent to which he provides a perfect example of the subject of my talk. But more of that at the end. So, this is indeed ‘an age of wondrous machines’; but it is also an age of mixed messages about those machines. Many British GPs say they are enjoying practising under the new National Health Service contract; that they are finding the achievement of targets satisfying; that in important clinical areas, for example in the management of long-term illness and cardiovascular risk markers, they are conscious of working to much higher standards. Some say they are looking back with embarrassment on the performance standards which they so recently thought acceptable. The removal of round-the-clock responsibility for patients has enabled them to have personal lives during which their professional roles are effectively suspended. This has improved their personal relationships and freed them from the miasma of dangerous tiredness that is so much a part of traditional practice. But we also hear that GPs are ‘very, very busy’; that they have ‘ghastly targets to hit or we lose chunks of income’; of a constant preoccupation with ‘the hideousness of revalidation’. We hear complaints of a snowstorm of impractical edicts and regulations, each appearing before the last has bedded in. We hear of recruitment and retention problems, and of lessened job satisfaction and diminished human rewards. But more than this, there is a widespread feeling, not just amongst doctors but amongst patients too, that something precious about the relationship between GPs and patients – something intangible which had found an hospitable environment during the first half-century of the NHS – is insidiously being lost. 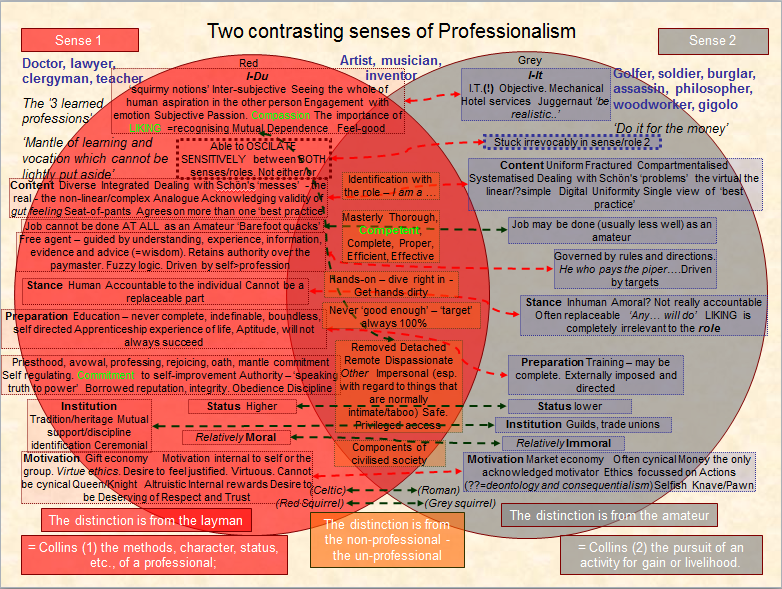 It was in an attempt to clarify this confused picture that I organised and chaired a session at the Bournemouth Spring Symposium, 2004 called The Challenge to Professionalism. It was clear that many of the delegates agreed with the importance of this subject because the session was packed to capacity. But, by its end, after four presentations and a vigorous discussion, the confusion had if anything worsened: half the delegates appeared to leave the room confirmed in their belief that general practice is more professional than it has ever been, while the other half left equally convinced that GP professionalism in Britain is losing its soul. How could a roomful of intelligent people with so much in common have come to such apparently opposite conclusions about the same issue? This is the question that I and three of those who spoke that morning have been addressing during the two and a half years since that meeting: we comprise one professional philosopher, Martyn Evans, Professor of Medical Humanities at the University of Durham (an Honorary Fellow of this college); two GPs, Dougal Jeffries from the Isles of Scilly and Iona Heath from not far from here, and myself, a retired GP. We think we have found an answer, and I was given the daunting job of putting that answer into words. I have been trying to do this for a long time, but I am truly grateful to you for having now given me the impetus and deadline I needed that I needed to bring the process a conclusion. Our answer, which you may think a bit of a let-down after all that preamble, is that the word ‘professionalism’ means different things in different contexts. This is true of many words in common use but it is important in this case because some of the meanings amount to polar opposites, and because we use the word all the time without recognising its ambiguity. So it is as though we had one word in the language to mean both chalk and cheese, and we hadn’t realised that this is a problem. In that case, splitting the word clearly into its two meanings might well reveal common ground in what had previously appeared to be intractable gastronomic controversies. Here is an illustration. When a parliamentary candidate I know was admonished by her doctor for being overdue for a cervical smear and told, ‘You are messing up my targets … you must realise we have a business to run’ some people will say that the GP in question was being very professional. And others will say that she was being very unprofessional. Both are right. Similarly some will say that the parliamentary candidate is being professional in passing this story on and welcoming its publication, and some will say that she is being unprofessional. Again both are right. And some will say that I am being unprofessional in including this story in an address which aspires to be a contribution to serious discussion, and some will say that I am being professional. So there is a conflict here which results in a profound confusion about what it means to be a professional in general practice in Britain today, as we struggle to define the proper place, if any, for humanity and individual purpose in a world of ever-more-powerful machines and automatic information systems. In this lecture I shall analyse this conflict by exploring and comparing the characteristics of two different kinds of professionalism, concluding that both are essential. Policy-makers must be helped by front-line clinicians to understand that there is a less tangible kind of professionalism which is currently being placed under threat by their own, probably well-intended, actions. This kind of professionalism, although it may be important in only a small proportion of the total number of GP-patient interactions, and although it is generally invisible to onlookers, is in fact the defining characteristic of the GP role. I and my three friends are determined that it shall not be lost through ignorance or default. ‘Interpersonal’ corresponds to ‘the methods, character, status, etc., of a professional’. ‘Technical’ corresponds to ‘the pursuit of an activity for gain or livelihood’. An obvious alternative name for the Technical kind of professionalism, to make the contrast with ‘interpersonal’, is ‘impersonal’, but this term is, we think, too loaded with negative connotations. We propose ‘Red’ and ‘Grey’ as a more appropriate, and indeed more colourful, shorthand. Red is the colour of passion and romance, while grey is, self-evidently, grey, as well as being the colour of warships. Furthermore, the two colours can be related figuratively to squirrels, to which they correspond rather aptly: red squirrels are small, appealing and vulnerable, and have been driven, like small-scale general practice, into wilderness refuges in the Celtic fringes of the British Isles. Grey squirrels on the other hand are larger, more efficient, always win in a fight, and came from America. ‘Grey’ professionalism, then, takes its seat in the head and is all about logic, while ‘Red’ lives in the heart and is all about feelings. Grey tends to facts, to the hard, to the cold, to the digital; red to the soft, to the warm, to the analogue. So where the red deals in fuzziness, the grey offers clarity, proof and even certainty. (No wonder it wins in a fight.) Very broadly, red relates to the subjective and to art; while grey relates to the objective and to science. And in historical terms, grey corresponds to the Enlightenment thinking of the late eighteenth century, while red corresponds to the Romanticism of the early nineteenth. Having distinguished these two kinds of professionalism I now want to illustrate some disparities between their respective practices. First I will compare the nature of the material dealt with in each case, referring here to the work of Donald Schön. Then I will proceed to contrast the nature of the relationship between doctor and patient/client, with particular reference to the work of Michael Buber. Then I will discuss differences in motivation in the two roles, and finally contrast the nature of the knowledge base from which each kind of professionalism springs. Having done all this I will describe the particular way in which these widely disparate approaches can be combined into modern practice without compromising its intellectual rigour. Finally, confident that ‘grey’ professionalism is as securely entrenched as its benefits are self-evident, I will finish with an action plan for conserving those ‘red’ aspects of professionalism that I and my collaborators believe to be endangered. This kind of talk doesn’t cut much ice in the ‘grey’ world but the difference is crucial: to repair a car is to resolve a difficulty; to devise a policy to improve the quality of care in a health service is ultimately – at the end of all the complex, systems-led science – to tackle a mess. To Schön’s analysis we would add the following: the grey professional focuses in detail on parts, while the red professional (and here the GP provides the classic example) deals with integrated wholes. So the grey approach is exclusive, while the red is inclusive. The first is, or can be, closed, finished, and certain; the second is open and provisional, and will always remain so. Far from being unscientific, as many non-scientists believe, this uncertainty is the very hallmark of science. This was made clear by the great philosopher of science Sir Karl Popper who showed that one of the few things science can be certain about is that scientific knowledge will for ever remain uncertain. So ‘grey’ professionalism deals with the simple, the linear and the predictable, while the ‘red’ deals with the complex, using that term in its mathematical sense to mean non-linear and unpredictable. Again these differences correspond to those between the Enlightenment conception of art, which was all rule-driven technique, with the artist as a technician who focussed on the emulation of classical forms, and the utterly different Romantic conception of the artist as a genius, acting as an intermediary in mankind’s search for a permanently elusive reality beyond. These differences could not be more profound. Now we come to the kind of relationship implicit in each role. Our grey professionalism corresponds closely to the relationship defined by the influential twentieth century theological philosopher, Martin Buber as I-It. Or rather, in his native German, Ich-Es. While our red professionalism corresponds to his Ich-Du. Ich-Du is usually translated into English as I-Thou, as for example in the title of Buber’s book, I and Thou. But this choice of words is unfortunate and may explain the failure of such a valuable concept to penetrate beyond specialist theological circles – at least in the English-speaking world. The German du, like its French equivalent tu, cannot be translated accurately into English. Du was rarely spoken in Buber’s Germany. It implies an intimate closeness; a relationship with a past, a present and a potential for a future. You cannot say Du until you know the other person feels the same about the relationship. It implies commitment, and being there for the other person, no matter what. Applied literally to general practice this wording is an unrealistic idealisation, and probably always has been, but this does not lessen the force of the distinction. Unfortunately, therefore, the word thou is not merely a weak translation of this concept (and a pretentious and off-putting one to modern ears at that) but it conveys a sense of remoteness and alienation which is the opposite of what Buber was talking about. Properly understood, however, we believe Buber’s Ich-Du relationship becomes a powerful and accessible description of something that happens, sometimes, and to some extent, between a general practitioner and his or her patient. This relationship is one of mutual respect and exchange, in which both parties are open and vulnerable to the humanness of the other. It is difficult if not impossible to define, but we recognise it without question when we experience it. Perhaps the most successful attempt to describe it has been John Berger classic portrait of a West-Country GP, A Fortunate Man, of which Jean Mohr’s photographs were such a crucial part. “He is acknowledged to be a good doctor because he meets the deep but unformulated expectation of the sick for a sense of fraternity. He recognises them”. From what I hear of Tom Stewart, he was ‘acknowledged to be a good doctor’ in exactly this sense. But there is another key point here: Buber insists that the I-It is every bit as necessary as the Ich-Du – (the “I-Thou”). Both kinds of relationship are essential and the two are in continual dynamic flux. One is not better than the other. Indeed any such comparison is meaningless – a ‘class error’. In other words, an attempt to compare two things of entirely different kinds. Not chalk and cheese – more a case of chalk and, say, happiness. For Buber, confrontation between the two approaches has no place whatsoever; the thing he calls for so urgently is dialogue. So the I-It relationship provides the objective, the mechanical, the infrastructure – utterly essential to life, and perhaps all that is required in the GP-patient relationship for a large proportion of the time. The Ich-Du brings in what we might call the ‘squirmy notions’ of mutual recognition, mutual vulnerability, empathy, engagement with emotion. In a word, compassion. The two sides can come together when for example I-It, objective, science provides evidence of unexpected Ich-Du phenomena, for example hard scientific evidence that patients have better clinical outcomes when their doctors adopt a positive outlook in a consultation. (As in Bruce Thomas’ classic studies from general practice.) But where the two sides do not come together is in the issue of continuity of care. In the grey, I-It kind of professionalism, continuity with the same GP is unimportant. Indeed, the contemporary wisdom holds it to be self-evident that, thanks to sophisticated treatment protocols and medical record systems, ‘any doctor will do’. Personal continuity of care is not merely thought unnecessary but sometimes actually undesirable. Just as OFSTED inspectors who have personal knowledge of a school they are inspecting are described in the internal jargon as ‘contaminated’, so prior knowledge of a patient may also (it can be argued) seriously compromise a doctor’s judgement, however much the doctor tries to maintain professional objectivity. In complete contrast to this, continuity is not merely essential to the Ich-Du relationship; without it there cannot be an Ich-Du relationship. The ‘red’ professional can never be a ‘replaceable part’ in the way that the grey professional certainly can. So the red side of a doctor’s professionalism continues to regard the client as patient while his or her grey side tends increasingly to see the patient as a client. And in grey professionalism liking a client has (in W.S.Gilbert’s words) ‘nothing to do with the case’. From the establishment of the NHS in 1948 general practice acknowledged the fundamental commitment of one individual to another by insisting on a formal link between a named doctor and a named patient. In the new contract of April 2004 this was replaced by a contract between patients and organisations, a change that has made little or no practical difference so far, but is indicative of the profound shift that has occurred in principle. It is also a change of which few patients are so far aware. We think that it is likely that if they were aware of it many would regret it. Doing a thing for the money, especially making your living by doing the thing, is perhaps the characteristic which is most commonly seen to define ‘professionalism’. But again this is simplistic – there is another kind of motivation, sometimes seen to be every bit as clearly defining of professionalism, which is almost exactly the opposite. In this latter kind the desire for money takes second place to the desire for self-respect; for the satisfaction of feeling valued and needed; for the pleasure gained from living in a just society; and to the desire to avoid the unhappiness of witnessing injustice and inhumanity. Altruism, notoriously difficult to prove, may also take its part. A good example of this second kind of motivation is seen in Citizens Advice Bureau volunteers: they display a high level of professionalism in their work, are highly trained and relentlessly audited, work under enormous pressure (not at all unlike a GP surgery) yet give their time and services entirely free of charge. If it were true that all professional motivation is ultimately mercenary, this kind of thing would surely never occur. Yet we know it to be commonplace. The scientific community, as it has traditionally existed, is another example. For the professional scientist, peer-respect rather than money is the crowning reward of success. Again, the British National Health Service, an institution which may have been more unusual and precious than those of us who grew up in it ever realised, allowed many doctors to separate their professional dealings with patients almost entirely from financial considerations. Practitioners were thus liberated by the assurance of good salaries, working conditions, pensions and job security. So in this analysis ‘grey’ professionalism corresponds more to the ‘market economy’ in which status is accorded to those who have the most, while red professionalism corresponds more to the ‘gift economy’, in which status is accorded to those who give the most to others. We should temper this analysis, however, by recognising that grey professionalism achieves much of its dynamism and effectiveness from the human fascination with mechanical problem solving and also from the (entirely legitimate) human satisfaction derived from the achievement of targets. The knowledge base of ‘red’ professionalism, as it is used as the basis for practical decisions, is open, provisional, and forever incomplete. It is under constant review throughout the entire career of the practitioner. It is acquired by the open-ended, life-long process of education rather than the closed, delineated process of training. Potentially, any information and experience whatsoever can contribute to it. No fixed curriculum can ever encompass it. One crucial corollary is that in any given situation there is likely to be legitimate disagreement amongst colleagues about the correct way forward. In the case of the GP, this personal knowledge-base includes a working representation of the whole of medical knowledge, integrated with an appropriate awareness of psychological and social issues. This knowledge-base is educated by textbooks, journal articles, colleagues, specialists, protocols, guidelines – in a word by ‘evidence’ – but it is never blindly controlled by them. So, ‘red’ professionalism, in an enormously demanding and life-long endeavour, avidly seeks out advice, information and experience and uses it to build up and maintain a personal understanding upon which to base its day-to-day decision making. In contrast, the knowledge-base of technical, ‘grey’, professionalism in its purest form – for example the knowledge-base of the professional rank & file soldier – is acquired by training rather than education. It consists of techniques, rules and protocols which are the accepted stock of that particular trade. This stock can, at least in theory, and at least at a particular time, be closed, final and complete. It is no part of the role of the individual to change or adapt it, only to follow it. Failure to follow these rules will render the offender prima facia culpable, regardless of the outcome, even when the outcome of such ‘off-piste’ behaviour turns out to have been for the good. And heaven help the offender if the outcome turns out to have been bad! And here again we have the crucial corollary: there will be agreement between everyone – colleagues, instructors, rank & file – about the correct course of action that should be followed in any particular case. Again, in principle, to the technical, ‘grey’ professional, ‘targets’ are binding; to the red-blooded, interpersonal professional they are advisory. Again, when a ‘grey’ professional achieves such a target the job is at an end; but if ‘red’ professionalism reaches a target it has been set (or, more likely, a target that it has set for itself) responsibility to the next client, or patient, is not reduced in the smallest degree because the target has already been met. In other words, to ‘grey’ professionalism rules and targets are absolute, while to ‘red’ professionalism they are relative – things to be taken into account in the understanding of the situation, never aims to be pursued automatically, or blindly. In ‘grey’ professionalism, therefore, ‘working to rule’ is the theoretical ideal; in ‘red’ professionalism it is the opposite – abdication. The deeper point here is that mechanistic, rule-following behaviour and independent, evidence-informed behaviour will normally be indistinguishable. In other words, the GP dealing with a particular problem on the basis of his wisdom, experience, and knowledge of his subject will normally deal with it in more or less exactly the same way as he or she would if they were following exactly the prescription of a sophisticated expert system or treatment protocol. Indeed, as rules and protocols improve, this ought to become progressively more and more literally true. Nonetheless, however similar the surface appearances, the underlying decision-making process of understanding-based, interpersonal (i.e. ‘red’) professionalism will always be an entirely different kind of thing from the strict working to rule of technical professionalism. ‘Red’ professionalism operates independently, within the bounds of a code of conduct which may be set widely but is ultimately fixed, and it will certainly make use of protocols and information systems of many kinds. But it uses these as tools-of-the-trade (and by ‘tools’ I here mean especially the knowledge-base of the trade) as its servant, never as its master. In the modern world it is increasingly assumed that motivation comes from outside the individual. Thus we have targets, protocols, audits, annual reports, mission statements, and with them a burgeoning army of workers who oversee jobs instead of actually doing them. This trend is often thought to be an inevitable part of Progress. It is a trend towards the kind of professionalism which is associated with soldiers, in which it is ‘professional’ to subjugate large areas of decision-making to officers, and away from the kind of professionalism which is traditionally been associated with doctors, in which individual freedom and autonomy were violated only in the most exceptional circumstances. There are many aspects of this change which are heartily to be welcomed. Much of it follows from the raising of standards and the fact that medical knowledge has now been assembled and catalogued into a body which is larger, more complex, and based on more evidence, than can be held reliably in any one human mind. Indeed, once it becomes possible to base professional actions on a super-human body of knowledge it almost automatically becomes culpable not to do so. With no sign of a slow-down in the exponential growth of IT power this trend is certain to continue and may well accelerate. Yet there are some things which human minds can do which codified information systems cannot do. This is certainly true at the present level of IT sophistication, but some argue, as for example the distinguished Oxford mathematician Sir Roger Penrose does, that it will always be true that there will be some functions which automatic systems cannot perform, however advanced those systems become. Whether or not this is so, it is certain that for the foreseeable future there are qualities of the human mind which are essential and indispensable for the general practice of medicine and for other activities of a similar nature in other walks of life. For example, they enable the reconciliation of incompatibles, irrationalities and impossible expectations, things which you will recognise as the very stuff of general practice expertise. GP’s are often faced with logically irreconcilable conflicts such as the one which commonly arises between the needs of a individual patient and the needs of society in general. In the phrase coined by Iona Heath, the GP copes in such seemingly impossible situations by adopting an ‘oscillating gaze’. In some mysterious way it is possible for both aspects of the dilemma to be entertained in full force in the mind of the practitioner, who employs a constellation of resources, not least expert advice, so that on the vast majority of occasions a satisfactory resolution is achieved, or at least a satisfactory compromise. Our society’s forgets at its peril the importance of nurturing people who use such priceless abilities in their daily work. Years ago I made the mistake of signing a certificate one day early – it was the certificate to say the pregnant woman had reached 26 weeks gestation and was therefore entitled to her maternity grant. Immediately, it was returned as invalid by some nameless official. I was aware, as the official should have been, of the extent to which the period of gestation is an approximation, so I couldn’t resist re-submitting it, now signed on an acceptable date, with a note saying: “People who behave like computers will inevitably be replaced by computers“. There was no reply, so they probably already had been replaced, computers having, amongst their frequently-overlooked deficiencies, no sense of humour. For the ‘red’ abilities that I have been describing to operate they must have freedom. And while this freedom must have strict boundaries, those boundaries must be much wider and freer and must allow more room for manoeuvre than ‘grey-squirrel’ policy-makers and theorists would like. The notion that, thanks to technical advances, complex human activities like general practice can now be codified into systems of rules, is simply wrong. The idea that the model of ‘grey’ professionalism is capable of eliminating risk (and therefore blame) from life, is a mistake. That is about as far as we can go with our red/grey analogy, because taken any further it leads to a very serious misunderstanding – it creates a false polarisation and implies that professionals have, like squirrels, to be either ‘red’ or ‘grey’. On the contrary, the two can brought together, and must be, it is now time to consider how this can properly be done. The first thing to see is that if we attempt this merging from the ‘grey’ side, it is simply impossible. This is because, by its very nature, ‘grey’ professionalism cannot incorporate the fuzziness of the red. It is inclined, as has been said above, to treat the ‘red’ with contempt – as obsolete, irrelevant, or even harmful. Emotion, for example, is commonly seen as the enemy of efficient professionalism. Not only that but ‘grey’ professionalism views any attempt to qualify it, water it down – to colour it even slightly red – as an attack on its virtue. The truth is that there is an element of fundamentalism inherent in the ‘grey’ approach. But approaching from the other side things could hardly be more different; ‘red’ professionalism can certainly incorporate the grey. And not in some sort of muddy compromise; it can do so whole-heartedly and to its fullest extent. Thus the ‘red’ professional can make full use of protocols, guidelines, books of instructions, recipes. But only when appropriate, always using these things as tools, never as master. That is the fundamental difference. And this is where Tom Stewart once again provides such an extraordinarily fortuitous example. I didn’t know him personally, as far as I can remember, although I knew of Sonning Common Health Centre and of course I knew of John Hasler. But my brother, Andrew, as a one-time co-author with him, did know him well. He remembers him as a revered trainer, and a family doctor who was the epitome of the best traditions of the ‘old school’. As far as Andrew can remember, everybody loved him, which is a dangerous thing to say about anyone, ‘love’ being the only four letter word that is still taboo, but it is also about as ‘red’ as you can get. But at the same time, Tom Stewart was one of the first GPs to see the staggering potential of computers. The book he and Andrew published in 1989 was one of the first on the use of computers in general practice. It was called ‘Computers: A Guide to Choosing and Using’. So while Tom was ‘red’ to the core, his effectiveness as a doctor was enormously enhanced by the enthusiasm with which he assimilated the ‘grey’. The pattern of enlightened professionalism he exemplified applies far beyond medicine, but general practice is the best example of all. For in general medical practice we have some of the most highly-selected, highly-trained, and powerfully-motivated members of our society – nothing beats the responsibility you feel towards the human being sitting opposite you in surgery who is putting their trust in you. But the ascendancy of the ‘grey’ approach, and its enthusiastic espousal by the Royal College of General Practitioners during the crucial final years of the last century, has left general practice bewildered, and ‘forced’, as I said at the time, ‘to express itself in terms which deny its very nature’. But as Iona Heath pointed out, in one of the most famous tracts of modern general practice literature, there is an element of ‘mystery’ in General Practice, and perhaps that means an element which cannot be logically reconciled; cannot be reduced to a formula. But to say that is not for one moment to deny science, or to join the perverse fashion for irrationality and ignorance which is currently so prevalent as to amount almost to a counter-Enlightenment. On the contrary, it has never been more important for modern doctors to be bastions of science, just as they are empowered by science. When a GP talks of ‘intuition’, or of using his ‘art’, he is not saying that he acts on those abilities alone, he is acknowledging that he uses them as a guide and short-cut (of incredible accuracy and efficiency – and I mean ‘incredible’ literally because its power is beyond our understanding), and then to disprove, modify or confirm these intuitions by means of scientific tests before taking action. So what we are really saying is close to Shakespeare’s, ‘There are more things in heaven and earth, Horatio, than are dreamt of in our philosophy.’ Or in more prosaic terms, ‘we don’t know all the answers yet, and thank heaven for that’. The discussion above, which I fear may appear rather abstract in places, can be brought into focus by consideration of the New Contract for NHS general practitioners which came into force in April 2004. This contract codified a style of practice which is radically different from that which was normal during the latter decades of the last century. I must emphasise that my collaborators and I believe many of these changes to be welcome, but our purpose is to argue that they also threaten something which is unique and precious and which in consequence is now in danger of being lost. The ‘red’, Ich-Du, flavour of professionalism does not fit in to the new, ‘grey’, way of doing things. What’s more, from the macro-political perspective this approach appears insignificant and, when it is noticed at all, it is treated with contempt. But at the interpersonal level it is precisely this aspect of professionalism which is most valued; almost without exception we sense its fundamental importance. And that includes the politicians themselves in their own (perhaps infrequent) interactions with their personal GPs. The story of the parliamentary candidate mentioned at the beginning of this talk is a case in point. Currently GPs are seeing primary care being used as an instrument of public policy, with little debate about the underlying values of that policy or of their freedom to dissent. There is a very real danger that the trend towards detailed political control of clinical care will continue if a stand is not taken by doctors on behalf of their patients. Hitherto unprecedented information technology has provided politicians with hitherto unprecedented powers of control. They of course regard their motives as benign, but we should remember that the Nazis were very keen on public health and hygiene. How they could have used the micro-chip if they had had it! The emphasis in public health policy on eliminating smoking and tackling obesity may be laudable, but it must not be allowed to exert a tyranny within the consulting room, with primary care staff as its agents. Never has it been more important for GPs to assert the independence of their role and the unique validity of their point of view. That is why GPs should use, and be seen to use, the ‘exceptions’ in the Quality and Outcomes Framework of the new contract conscientiously to protect individual patients from dictatorship by targets. That is why they should never use, or be seen to use, pounds-for-points as the main focus of their role, and never encourage or require colleagues to do the same. That is why they should demonstrate a critical awareness of the vested interests that influence clinical guidelines and practice: vested interests that include professional bodies such as the Royal Colleges, powerful patient groups, and above all the pharmaceutical industry. That is why they should protect the central values of compassion and confidentiality from the incursions of managed care and information sharing. Above all, that is why they should fight to retain the right to say ‘no’ when they believe something to be wrong, and why they should stand together as professionals to defend that right when they can see that the greater good requires it. If general practice has the courage to do such things, and stand up to the unqualified and untrusted bureaucrats and politicians who have gained such bizarre ascendancy in recent years, it can reclaim its heritage and the role expected of it by patients. Then we can celebrate this mysterious ability of ‘red’ professionalism to use all the different modes and capabilities I have listed above, and many more that I haven’t, and somehow manage to oscillate sensitively between them, whilst at the same time immeasurably enhancing these abilities through the power of modern technology. But as we celebrate our kind of professionalism, we must also protect it. For one thing is certain, left to nature the ‘red’ approach, like the red squirrel, doesn’t stand a chance. You can’t fight statistics with feelings, it’s not even like steel against butter, it’s more like, say, steel against happiness. So we have to persuade our society that feelings count, and then we can start to compensate and deliberately balance the fight. But to do that — to even begin such persuasion — we have to find the necessary words. That is exactly what I have attempted to do tonight: by distinguishing two colours of that deeply ambiguous concept, ‘professionalism’: the ‘red’ and the ‘grey’.